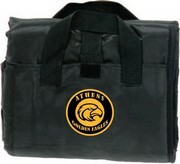 Our Our waterproof blankets are one of our most popular items for outdoor sporting events. Sure, our fleece stadium blankets and sweatshirt blankets are favorites as well, but they don't offer quite as much protection from the elements. Not only does it have the cozy micro fleece on one side, it also has the nylon backing on the other helps to shield against wind, rain, and snow.